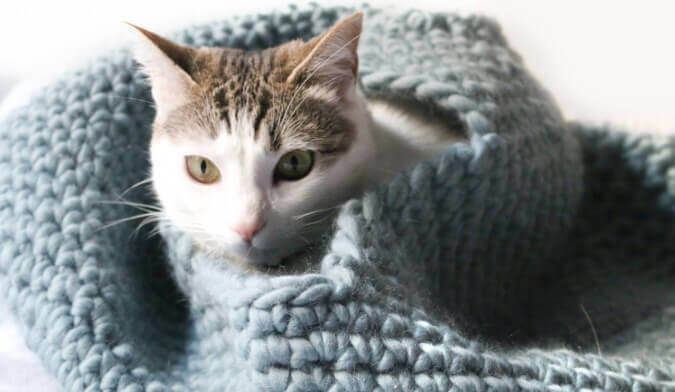 This crochet cat house pattern is so cute and cozy and sure to become your kitty’s favorite place to snuggle! A huge thank you to weareknitters.com for sharing this pattern with us today! And guess what? Weareknitters.com is giving P2P readers 15% off their next weareknitters.com order. Just use coupon code PETALSTOPICOTS at checkout. Crochet Cat House Pattern is reprinted with permission from weareknitters.com. Start: first form a magic circle with your crochet hook. Round 1: crochet 8 single crochets into the magic circle and then close it. Round 2: make an increase in each stitch throughout the whole round. You will have a total of 16 stitches. Round 3: make an increase followed by a single crochet throughout the whole round. You will have a total of 24 stitches. Round 4: crochet 2 single crochets followed by an increase throughout the whole round. You will have a total of 32 stitches. Round 5: crochet a single crochet into all stitches. Round 6: crochet 2 single crochets followed by an increase throughout the whole round until there are only 2 stitches left. Crochet a single crochet followed by an increase. You will have a total of 43 stitches. Round 8: crochet 2 single crochets followed by an increase throughout the whole round until there is only one stitch left. Crochet a single crochet. You will have a total of 57 stitches. Round 9: Crochet a single crochet into all stitches. Round 10: crochet 2 single crochets followed by an increase throughout the whole round. You will have a total of 76 stitches. Round 11: Crochet a single crochet into all stitches. Round 12: crochet 4 single crochets followed by an increase throughout the whole round until there is only one stitch left. Crochet a single crochet. You will have a total of 91 stitches. Rounds 13-16: Crochet a single crochet into all stitches. Round 17: crochet 5 single crochets followed by an increase throughout the whole round until there is only one stitch left. Crochet a single crochet. You will have a total of 106 stitches. Round 18: Crochet a single crochet into all stitches. Round 19: Crochet a single crochet into the first 48 stitches. Cut the thread leaving a few cm to weave it in later and then skip the net 10 stitches. Crochet the rest of the round in single crochet. Round 20: Crochet a single crochet into the single crochets of the previous round until you get to the last 5 stitches of the opening. Crochet single crochets into these stitches, introducing the lose thread in between the stitches so as to hide it. Cut the thread again and skip the same 10 stitches as you did in the previous round, starting to crochet the following single crochets (where you hooked up the previous thread). Continue crocheting single crochets throughout the rest of the round. Rounds 21-25: repeat the steps in round 20, cutting the thread each time that you get to the part that forms the entrance to the house and then continue with the other half. Don’t forget to always hide the remaining threads of wool in each round, weaving them in between the already finished single crochets. It is important that you always work with exactly the same stitches as you did in the previous round so that the entrance doesn’t get wider and wider with each new round. Round 26: Crochet a single crochet into each stitch until you get to the part with the entrance. This time, instead of cutting the thread, crochet 9 chains and then continue crocheting the rest of the round in single crochet (so that both sides of the house will be connected and we can close the entrance to the house at the top). Round 27: crochet 5 single crochets followed by a decrease throughout the whole round. You will have a total of 90 stitches. Rounds 28-31: crochet a single crochet into each stitch. Round 32: crochet 4 single crochets followed by a decrease throughout the whole round. You will have a total of 75 stitches. Round 33: Crochet a single crochet into each stitch. Round 34: crochet 2 single crochets followed by a decrease throughout the whole round. You will have a total of 56 stitches. Round 35: Crochet a single crochet into each stitch. Round 36: crochet 2 single crochets followed by a decrease throughout the whole round. You will have a total of 42 stitches. Round 37: Crochet a single crochet into each stitch. Round 38: crochet 2 single crochets followed by a decrease throughout the whole round. You will have a total of 31 stitches. Round 39: Crochet a single crochet into each stitch. Round 40: crochet 2 single crochets followed by a decrease throughout the whole round. You will have a total of 23 stitches. Round 41: Crochet a single crochet followed by a decrease. You will have a total of 15 stitches. Round 42: make a decrease throughout the whole round until there is only one stitch left y Crochet a single crochet. You will have a total of 8 stitches. Cut the thread and pass it through the rest of the stitches. Then pull on it to close the hole and hide it with the help of the knitter’s sewing needle. To finish the house, crochet an entire round in single crochet around the entrance, inserting the crochet hook into two stitches at the rim. This way you will bolster up the entrance a little. Thank you very much for the model ! I did not have enough thread to finish the roof, but it seems to please my cat anyway. way too small for adult cat. doesnt even stand up straight!! disappointed. 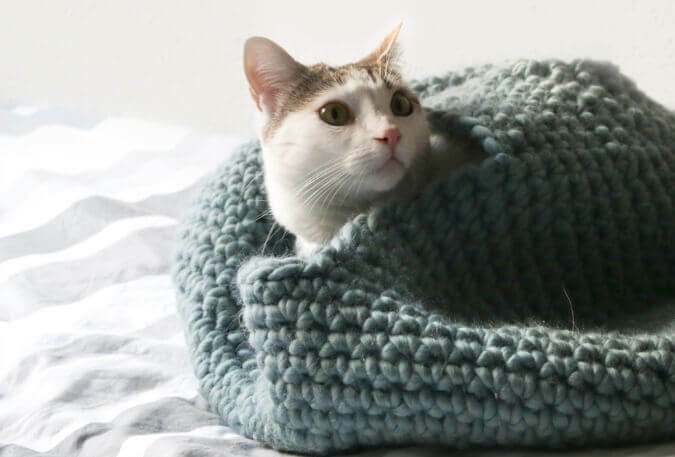 no one ever has patterns for adult cat beds/houses. what yarn was used for the one in the picture? Does it have to be a wool yarn? 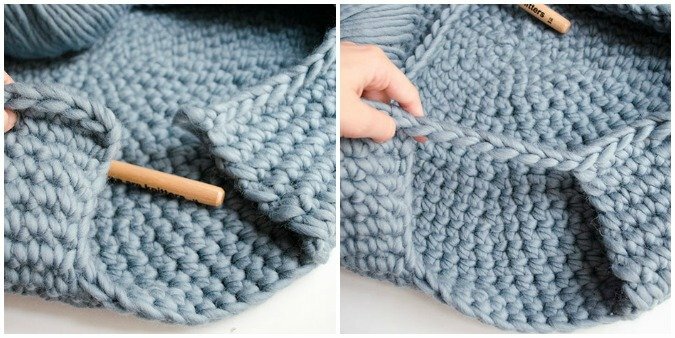 Can a cotton rug yarn be used? What a cute idea. I wonder if my cats would like one.